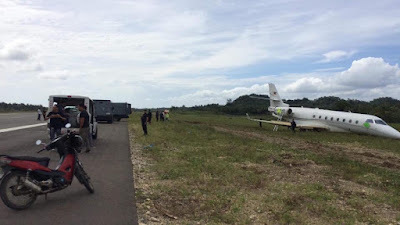 Aviation Updates Philippines - A Gulfstream G200 carrying six employees of the Bangko Sentral ng Pilipinas (BSP) made an emergency landing at the currently closed Bicol International Airport in Albay. DISABLED JET. 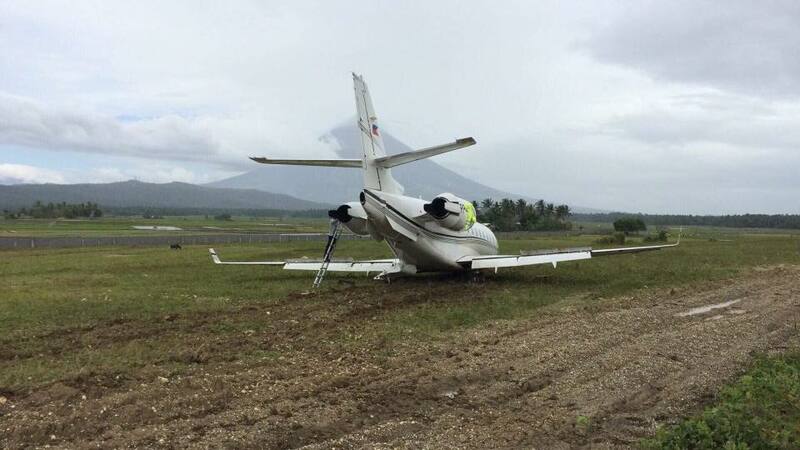 A Gulfstream G200 operated by AirTaxi.ph for the Bangko Sentral ng Pilipinas skidded off the runway at the Bicol International Airport. For the record, it is the first aircraft to land there. Photo by Joey Sarte Salcedo - Facebook. Civil Aviation Authority of the Philippines (CAAP) Spokesperson Eric Apolonio said passengers on-board the disabled aircraft were safe according to initial reports. The flight landed at around 11:32 AM carrying money for the central bank. The aircraft, owned and operated by AirTaxi.ph with registry RP-C280, was chartered by the BSP, according to BSP Legazpi deputy director Marlyn Paje. RESCUE OPS. Teams were already dispatched to the crash site. Photo by Joey Sarte Salcedo - Facebook. As the aircraft landed, the pilots noticed a guard house in the middle of the runway. This made prompted the pilot to veer off to the grassy right-side area of the runway. Prior to the approach, the pilots mistakenly identified the runway to be part of Legazpi Airport (IATA: LGP; ICAO: RPLP). 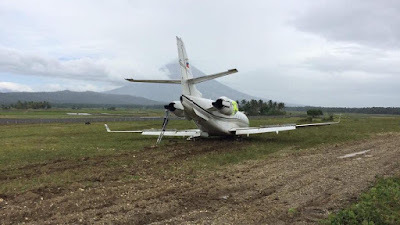 "Apolonio said in a phone interview that the Gulfstream G200 plane was reportedly about to land at the Legazpi City Domestic Airport when sudden wind drop hit the aircraft, forcing the pilot to land instead on the 2.5-kilometer BIA runway, which is undergoing construction," a reported by Rappler stated. CAAP is currently conducting an investigation to determine the cause of the crash. Teams were already sent to the crash site. Bicol International Airport is located in Barangay Alobo, Daraga, Albay which is approximately ten kilometers from Legazpi Airport. The airport is currently closed and is undergoing construction. It is set to replace Legazpi Airport by this year.